In other news, Montana refuses to legitimately enter autumn and insists on holding onto summer as long as possible. It is in the high 60s as I write this, which personally I think is just ridiculous for October. Maybe it’s just me but I am definitely ready for cooler temperatures. Mainly because I want to run in like 40 degrees rather than almost 70 and then come home to a steaming bowl of soup, but until I get that weather machine working I’ll just be staring forlornly at the weather forecast. Shorts and tank top weather will be over soon enough (I hope) just in time for everyone to complain it’s too cold. In preparation for that glorious time of year, here is a fabulous and easy dinner recipe that’s great for a chilly fall day and conveniently includes almost all of the food groups. As a kid I was not big on the bell peppers thing. I still don’t really care for them raw, but I love them cooked in things. Stir fry, tacos, pizza, soup, stew, etc are all improved by the addition of a bell pepper or three. Bonus: veggies are healthy. I saw a picture of stuffed peppers on Pinterest a few months ago and thought to myself “that looks like something I could maybe handle” and then promptly never made it because it was 85 degrees outside and I didn’t want to turn on the oven. Fortunately it has cooled down a bit since then and my hypothesis was correct: they are delicious. 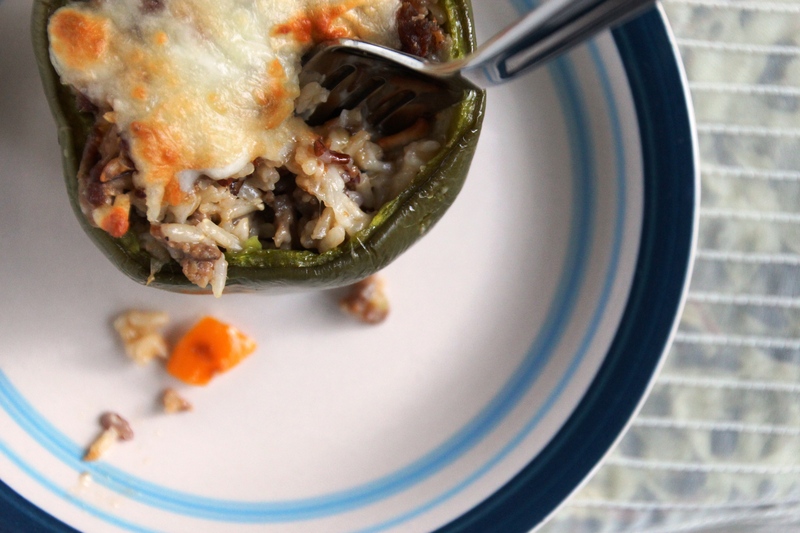 Wild rice, Italian sausage, cheese, and a smattering of other flavors come together in a delightfully simple recipe. Although it’s not super quick, particularly if (like me) you’re not practiced at cutting things, it’s incredibly easy and hard to mess up. You could cut down on the time by preparing them the night before and popping them in the oven when you get home from work. They may need a bit longer in the oven to warm through so make sure you check that the center isn’t cold. I did not add a lot of spices to mine because I was using hot Italian sausage and that was enough for me, but the addition of some red pepper flakes, cayenne pepper, curry powder, or whatever you’re feeling that day would work beautifully. 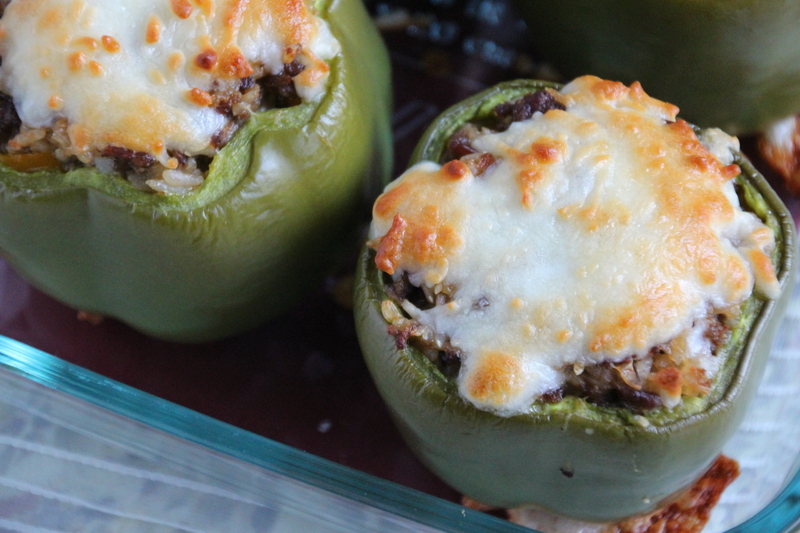 Conveniently you can taste the filling before you finish them up in the oven, so it’s easy to play around with the flavors before you stuff the peppers. Try adding zucchini or spinach for an extra veggie boost. Bake these up, serve with homemade applesauce and a glass of milk and you’ve got all the food groups covered in a healthy and delicious meal. Note: They reheat pretty well in the microwave but I find it works better if you cut them in half beforehand. Cook rice according to directions and set aside. Meanwhile, cut the tops off the peppers, hollow out the inside, and slice a bit off the bottom so they sit flat (if necessary). Dice the tops of the peppers (minus the stem of course), onion, garlic, and remaining pepper into small pieces. Saute meat and a little olive oil in a large pan over medium heat for a few minutes. When meat is about halfway done, add the diced veggies and continue sauteing until meat is cooked through and veggies are heated. Add spices to taste and stir to combine. 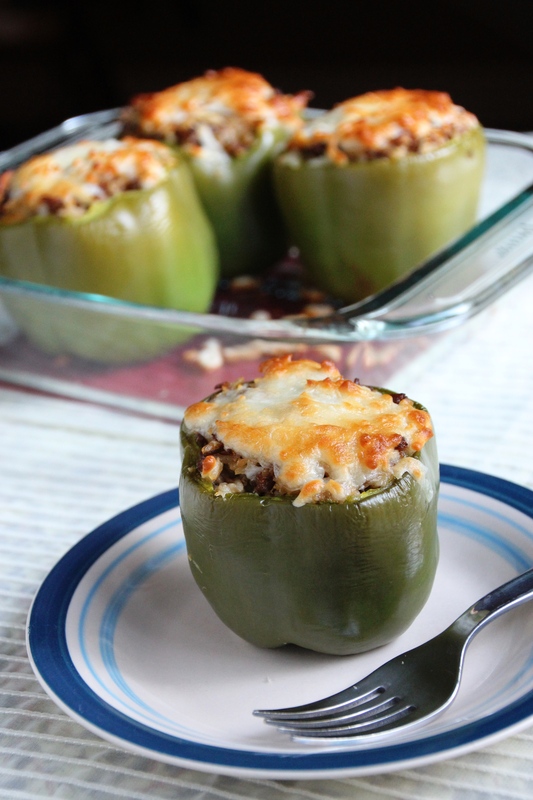 Bake about 30 minutes, then sprinkle (or pile) mozzarella onto the tops of the peppers and bake an additional 15-20 minutes, until cheese is melted and beginning to brown. Serve hot and refrigerate leftovers for up to one week. Glad you enjoyed it, your peppers look good!